"Oh, life is like that. Sometimes, at the height of our revelries, when our joy is at it's zenith, when all is most right with the world, the most unthinkable disasters decend upon us." It�s hard to recall a time when Bob Clark�s A Christmas Story wasn�t a staple of the holiday movie season. These days it�s quoted and revered like it was always a part of the cultural lexicon. Like many people, I discovered the film on VHS back in the mid 80s. My parents rented it during an approaching Christmas season and my whole family gave it a watch. The effect, unsurprisingly, was instantaneous appreciation. As a child of about six years old, I recall enjoying the hilarious hijinks of Flick�s tongue pressed against the ice cold lamppost, being intimidated by the heinous Scut Frackus and empathizing with Ralphie�s one-track-minded Christmas wish. At the time I think the G.I. Joe USS Flag aircraft carrier was my own personal Red Rider (only I never received it) and the days leading up to Christmas were both magical and agonizing. It�s easy to relate to this on any number of levels and, for my money, is the main reason that A Christmas Story has taken on such incredible popularity over the past 25 years. Before I knew it the film had become a strict holiday tradition for me (like many people). Even before TBS started with their 24-hour blitzkrieg, it was a staple in my house around the holidays. Honestly, is there another film out there that captures the holiday season as well? Beyond the great characters (I think there's a little bit of Darren McGavin in every father) and endearing wit, there�s a strong sense of Christmas atmosphere and celebration prevalent in every frame. Just as John Carpenter captured the atmosphere of the Halloween season in his seminal slasher film, A Christmas Story is thick with authentic Yuletide feel in nearly every frame. It's perhaps the first time that Halloween and A Christmas Story have ever been compared (unless the later was mistaken for that other Bob Clark Christmas flick), but I can other films that better exemplify their respected holidays. These days I find myself appreciating the film for the strong sense of nostalgia it invokes in me. 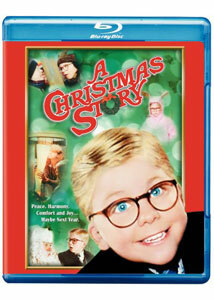 At 29 years of age, I watch this movie now and think back to Christmastime past - when I was a kid younger than Ralphie. It�s the little touches here that hold the most power for me today: Randy picking his brother�s cracked glasses out of the snow after his brawl with Scut, Ralphie�s discovery of his special Christmas present and the sentimental final shot of the kids all tuckered out after the big day. I know I'm bordering on sap at this point, but those sincere moments keep me coming back. It's a movie as endearing as the fondest of Christmas memories. Image Transfer Review: This film has never looked particularly great on home video and this Blu-ray release is certainly the best I've ever seen Bob Clark's film look. Shot intentionally in soft focus, A Christmas Story doesn't look particularly sharp, but the colors are strong and the black levers are excellent all the way through. Grain remains a consistent presence on this Blu-ray, but it's natural. Thankfully no DNR was applied to this release so you're left with perhaps the most accurate representation possible of this holiday classic. Audio Transfer Review: Presented in original English mono, the audio remains clear and strong throughout. There isn't a whole lot to say beyond that. It's not a flashy track (it's mono, after all), but there are no problems whatsoever with the clarity. Extras Review: The commentary by Bob Clark and Peter Billingsley is a delightful track, mainly due to the director's good-natured attitude. It's a warm little discussion as both participants still seem surprised by the film's lasting impact. Another Christmas Story (18m18s) is a discussion with director Bob Clark and child stars Peter Billingsley, Zack Ward, R.D. Robb where they share their memories of the film and it's impact on them today. Not a bad little feature, but ultimately an empty one. There's a five minute featurette on the making of the Red Rider gun and a Leg Lamp making of that runs a similar length. Neither of these little pieces leave much of an impact but they're worth looking at once. A text-based extra details script pages which feature a scene that was never filmed. A theatrical trailer and Leg Lamp promo round out this package. It�s hard to think of many Christmas films made after A Christmas Story with more sincerity than this and I�d like to think it�s the main ingredient for its belated success. Bob Clark�s film is funny and sweet � in equal parts � and while it�s not a flashy or overtly stylized movie, the substance is what counts. In that regard I can think of no better movie to ring in the upcoming holiday season.